Question: What are some important questions to think about before building a street rod? 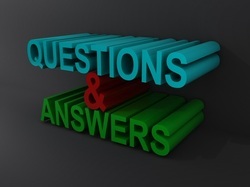 Answer: Building a street project is an important decision for anyone. Five things to think about before starting a street rod project are listed below. 1. What type of vehicle do you want to work on or build? Make sure that the type of car you are going to spend time, money and effort on is one you really like. --Do you really like the style of the vehicle? --Does the vehicle fit with your personality? --Will you still like the street rod when it’s completed? --Do you have a passion for working on the vehicle? Many street rod builders have started a project and after working on it for several months or years, stopped working it because they've lost interest. Don’t let this happen to you. 2. Do you want to rebuild an existing vehicle or build a street rod from the gound up? When rebuilding an existing vehicle, the basic design and many of the parts and components have already been established. When rebuilding, body work usually takes up a significant amount of time, effort, and money. 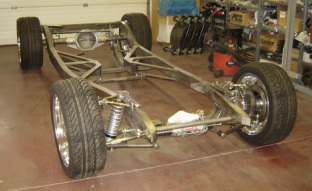 This may include making the frame stronger and redesigning the suspension, braking and control systems. When building a street rod from the ground-up, the builder has much more control over the project, its design, and its style. Plus, most of the parts and components will be new as shown by the new vehicle frame in the photo on the left. More time will be spent identifying companies that can provide the parts needed, including the frame, body style, engine, suspension, etc. The cost to build the project may be higher compared to rebuilding an existing vehicle. The type of skills and work needed on a rebuild will be quite different than building a street rod from the frame-up. 3. What is your level of skill, and how much can you do yourself? There are many types of street rod enthusiasts. Some have the skills to be totally involved in the design and building of the street rod. Others may have no interest in designing or building the street rod. However, they may have an interest in owning one, driving it, and taking it to car shows. There are some street rod enthusiasts who have excellent engine rebuilding skills. Others may have excellent electrical skills. Still others have welding, sheet metal, and other forms of metal fabrication skills. Knowing your skills will help make better decisions during the street rod selection and building process. 4. How much money is available to build or rebuild a street rod? By the time a street rod project is completed, it usually takes more money than initially planned. In many cases, the money spent will be spread across one, two, three or more years. Many street rod building projects have not been completed because it cost more than planned. Before getting too far into the project, make sure a budget or financial plan has been developed to get an idea of overall costs. 5. Will the vehicle be a “driver” or a “show car”? When building a street rod, think about how it is going to be used. 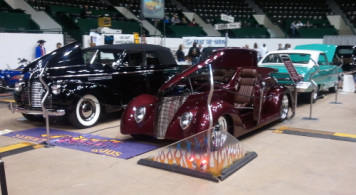 A “driver” street rod will be exposed to scratches, accidents, inclement weather, stones in the windshield, and general wear and tear on the vehicle. A “show car” will be brought to the car shows in/on a trailer, and only be driven a minimum amount. Thinking about how much the street rod is going be driven or shown, will guide you in making many decisions during the building process.